Team Training kicks off this week, and those at the Northwest Region are especially grateful! As many know, due to the California wildfires that tore through our community, the Schulz Campus was closed, and the dogs in professional training were evacuated. This was a huge effort handled with a great deal of love, precision and professionalism by our remarkable volunteers and staff. We are so grateful for their amazing team work and dedication. The dogs returned to campus last week and continued their work in professional training. Our trainers were so happy to have them back and gave extra pats, belly rubs and treats – fully-body wags for everyone! While we were deeply affected by the fires, we are very thankful that we, as an organization, are able to be agile, responsive, purposeful and loving – just like our dogs! Not only does Canine Companions have the best assistance dogs, we also have the very best volunteers, donors, supporters and staff. 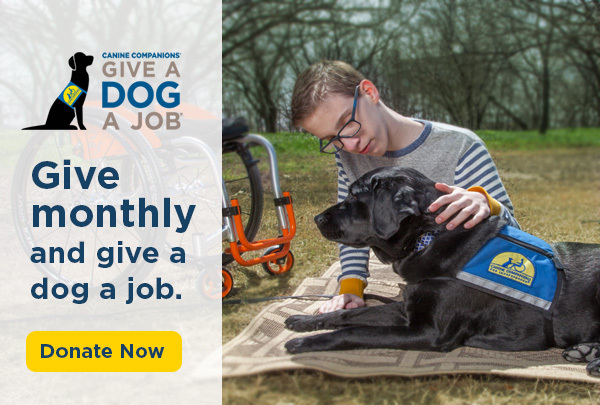 Be a part of our mission today to give independence – and Give a Dog a Job. Do not bring your Canine Companions dog into areas with debris or fire damage. These areas are unsafe for a dog’s airways, skin and paws. Be sure to hose off driveways, cars, patios and porches to help remove ash and toxins. You may want to do this several times until significant rains begin in the area. Wash your hands frequently. Your hands go near or touch your dog’s mouth, and washing often will limit the amount of contaminants that enter his or her body. Do not leave water bowls or toys outdoors. Be sure to thoroughly wash or replace dog toys that go outside. When entering your home, wipe your dog’s paws with fragrance-free baby wipes or a little mild soap mixed with water. Rinse well with water after using soap. Baby shampoo or dog shampoo is a good option. See your veterinarian if your dog is coughing, vomiting or showing any other signs of illness. Canine Companions is here for you during this difficult time of recovery and rebuilding. If you have any concerns, please reach out to us. The emergency line is monitored around the clock. While the wildfires in the area have devastated our community, the Canine Companions Schulz Campus has been extremely fortunate to have escaped with no harm. With the fires increasingly contained, campus reopened for business on Monday, October 17, and the 99 dogs in professional training will be returning to campus today, where they will resume training. Our amazing volunteers have organized the transportation of the dogs back to campus, and the car pools have been well underway since this morning. The air quality on campus continues to improve, and Dr. Kennedy and the veterinary staff will continue to monitor the air to ensure the dogs’ exposure outdoors is healthy. The Canine Early Development Center will also resume normal operation. Noted in an update last week, while several staff and volunteers have lost their homes to the North Bay fires, all staff and the 250 volunteers and graduates living in the affected areas have been contacted and are safe. As I reported, the Team Training class that had been underway last week was suspended for health and safety reasons. Program staff are now working hard to accommodate those nine students so that they can complete Team Training as soon as possible. Four of those students are joining the class that had already been scheduled to begin next Monday, October 23. That will bring that class size to 21 students, the largest class ever held on Schulz campus. The other five students will be attending a make-up class from November 6-17, in parallel with a scheduled Hearing Dog Team Training. For the Team Training class that begins next week, we are working on identifying an alternate location for graduation. Because the Luther Burbank Center has been damaged by fire, it will not be operational by that date. We will publicize the new location for graduation as soon as we can. Our volunteer puppy raisers and trainers have brought dogs to evacuation areas and to visit first responders over the past week, providing them some happy distraction and respite. Trainers will continue to coordinate these visits throughout the next few weeks, as well as coordinating similar visits to local schools. We are also planning a community open house this Friday afternoon on the Schulz Campus from 3-6pm in Gittinger Hall. This will be a time when both members of the Canine Companions community as well as those throughout the Bay Area can come, see what we do, interact with some dogs and relax. Once again, I would like to thank all of you who have so generously offered your assistance during these fires. The actions, goodwill and selfless support that so many of you provided are simply remarkable. I’m writing to update you on our current status. While the wildfires continue to wreak havoc on our community, our campus remains safely out of the fire zone. While the Schulz campus remains closed through the remainder of this week, staff who are able to reach campus safely are here and working. Any members of the Canine Companions community who require assistance can reach us at the numbers I provided in the last update, and which I’ve reprinted at the bottom of this email. We will attempt to open normally for business next week. However, since the fires continue and additional areas continue to be declared evacuation zones, business will no doubt be disrupted to a certain extent. While Canine Companions is safe and operational, many of our staff may be displaced into or through next week. As a result, we do not expect everyone to make it in to work. As I said in the last update, all Canine Companions staff are accounted for and safe. Unfortunately, three of our staff have lost their homes to fire, and more are in evacuations zones and uncertain about the fate of their homes. In addition to staff, the Canine Companions community has about 250 members, puppy raisers, breeder caretakers, foster sitters and graduates, in the areas affected by the wildfires. Staff have been able to reach all but 24 of this list. We realize the situation is chaotic here and have given these individuals several options for contacting us when their situation permits. Everyone who we’ve reached is safe, although I’m sorry to report that 12 members of our community have lost their homes. I’m also afraid that this number will grow as we are able to contact those we’ve been unable to reach so far. The dogs that were relocated from campus remain happily in foster care and, by all reports, are happy with a fall break from school. I would like to thank all of you for your amazing outpouring of generosity in response to this tragedy. The offers of assistance that came in via cci.org/nwrfirehelp have been tremendous, and I am thankful yet again to work with such a caring community. Our partners Eukanuba and Henry Schein have also offered help to those affected, as have many businesses and individuals. Thank you all. While the Schulz campus remains safe and is in an area of Santa Rosa that is not currently threatened by the fires, the campus will be closed Friday, October 13. We've been advised by the person who brought the fundraising scam to our attention, they were mistaken. While we are relieved of that, we still advise all of our supporters to check the authenticity before opening, donating or giving any of your information. 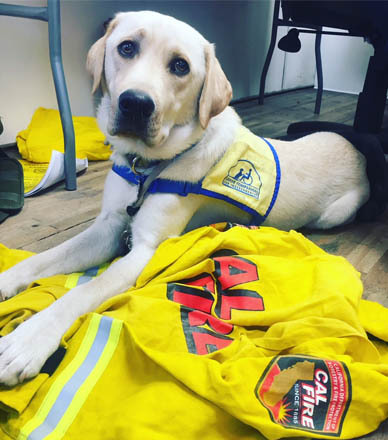 Again, Canine Companions for Independence has not initiated any fundraisers associated with the Northern California fires. Any campaign initiated by our organization would be featured on our website at cci.org. Many thanks to all of our supporters, volunteers and staff who work hard every day to make our mission possible. ATTENTION - We’ve been alerted by one of our supporters to a possible fundraising scam which may be targeting our Facebook followers. It was sent in a text from the 602 area code. Please be advised, this text did not come from Canine Companions for Independence and at this time, our organization has not initiated any fundraisers associated with the Northern California fires. Beware and check the authenticity before opening, donating or giving any of your info. Our headquarters and Northwest Training Center will be closed for the remainer of the week. I’m writing to update you on the effects that the wildfires in Northern California are having on Canine Companions and our Northwest Region Training Center. To begin, it is important to note that the Schulz campus remains safe and is in an area of Santa Rosa that is not currently threatened by the fires. However, due to the deterioration in the air quality to unhealthy levels, a forecast calling for higher winds, and an increasing number of staff who have been personally affected by the fire and subject to evacuation, we made the decision to evacuate the dogs and puppies to areas further from the fire and suspended a Team Training placement class. All of the students have been able to travel safely home and the dogs (and campus cat) are currently being fostered by Canine Companions volunteers and staff. The dogs will return to campus as soon as it is safe to do so, and the interrupted Team Training will be rescheduled as soon as feasible. All Canine Companions staff and area volunteers are accounted for and safe. Sadly, several have lost their homes and more have had relatives whose homes have been destroyed. While a separate email has gone out with instructions for any puppy raisers, breeder caretakers or graduates who need assistance, I’ll repeat that information for anyone affected who may not have gotten that message: The graduate department may be reached at 707-577-1755; the vet clinic for all concerns relating to puppies and breeders at 707-577-1745 and the emergency line at 1-800-833-5388. The emergency line is monitored around the clock. If we can be of assistance, please let us know. The Canine Companions community is a generous one. We have received numerous offers for help of all kinds, and your generosity is as remarkable as it is unsurprising to all of us who know you. I’d like to express my gratitude to the many volunteers, chapter members and staff who have pitched in to ensure the safety and well-being of our Team Training participants and dogs. Because we are receiving so many offers of help, and because the situation remains fluid, I encourage anyone interested in offering assistance (and living in the Northern California area unaffected by the fires) to go to cci.org/nwrfirehelp and register there. This will allow us to better track offers of help. Over the remainder of this week, the Schulz campus will be closed for regular business, and only those staff who can travel safely to campus will be here. Of course, this has impaired normal business operations and the next week or two will certainly be spent catching up. However, the campus is safe and operational, and essential business is being conducted. Again, if anyone in the fire zone requires assistance, please let us know via the numbers above. Updates about the campus can be accessed on this page (cci.org/nwrfire), and it will be updated regularly. Thank you for your support of Canine Companions and our mission, we remain grateful to you. Our thoughts are with all of those from our community and beyond whose lives have been affected by the fires. UPDATE | 9:48am Pacific Time – All dogs in professional training and Team Training participants have been successfully and safely evacuated from our campus. Thank you to all the staff and volunteers for all their work on such short notice. Our HQ and Northwest Training Center will remain closed Wednesday, October 11. If you are a volunteer puppy raiser, breeder caretaker or graduate who needs assistance, please call our emergency line at 1-800-833-5388. Our vet clinic will be checking messages. If you are a volunteer puppy raiser, breeder caretaker or graduate who needs to speak with someone from the clinic, please call 1-707-577-1745. UPDATE | 8:22pm Pacific Time – Canine Companions has decided to evacuate the dogs and Team Training students from our headquarters and Northwest Training Center on the Schulz Campus. Please note the campus remains safe, and there is no indication that there is imminent danger of fire here. However, with more areas in Santa Rosa being evacuated, an increasing number of staff are themselves needing to find temporary shelter. There is also the concern that, if the winds forecast for tonight were to necessitate the rapid evacuation of over 100 dogs, as well as the students, it would be harder to remove everyone in a safe and orderly way. As a result, we have suspended Team Training and are sending students home. Dog are being transported offsite. Dogs in professional training are being transported by staff to Richmond, CA, an area safely to the south of Santa Rosa. There they will be met by a number of Canine Companions volunteers including the East Bay and South Bay Chapter members with whom we’ve already arranged the dogs’ lodging. All the logistical details such as food, bowls, meds, etc. have been accounted for. Puppy litters currently at our Canine Early Development Center (CEDC) will also be transported tonight to the homes of our veterinarians Dr. Kennedy and Dr. Lin, both of whom live south of the fire area. The will be attended to by staff throughout the night. Our program, kennel/CEDC and vet staff continue to do an amazing job; the dogs are in good hands, and we will ensure all the students get safely home. The campus and offices will remain closed at least through Wednesday, October 11. UPDATE | 4pm Pacific Time – Due to the number of staff that remain evacuated or on alert, and the forecast for an increase in winds tonight and tomorrow, the Schulz Campus will remain closed today as well as tomorrow, Wednesday 10/11. While at this time the Canine Companions campus remains safe and operational, plans are being kept current for the evacuation of all dogs, staff and Team Training students were that to become necessary, and some staff will remain onsite overnight. It is expected that new areas may be added to evacuation zones. If you are a volunteer puppy raiser, breeder caretaker or graduate who needs assistance, please call our emergency line at 1-800-833-5388. We would like to express my profound appreciation for the dedication displayed by our staff to our dogs, Team Training students and Canine Companions community. Their concern to ensure the safety and well being of all and their willingness to remain onsite around the clock, filling in for staff who aren’t able to get in and ensuring that we are ready to evacuate at a moment’s notice, is truly impressive. We will continue to provide updates as the situation changes. UPDATE | Monday, October 9, 2017 - Our national headquarters and Northwest Training Center will be closed Monday, October 9 and Tuesday, October 10. We are secure and safe from the fires around Santa Rosa at this time. We have an emergency plan in place, and there is staff who will remain on campus throughout the night. Our Team Training participants and our dogs are being well taken care of, and we are doing everything to ensure their safety. Volunteer puppy raisers and graduates that need assistance should call our emergency line at 1-800-833-5388.